A Brief History of Liberty – and its Lessons: A Public ‘Ethics Initiative’ Lecture by Professor Philip Pettit of Princeton University in NUI Galway. 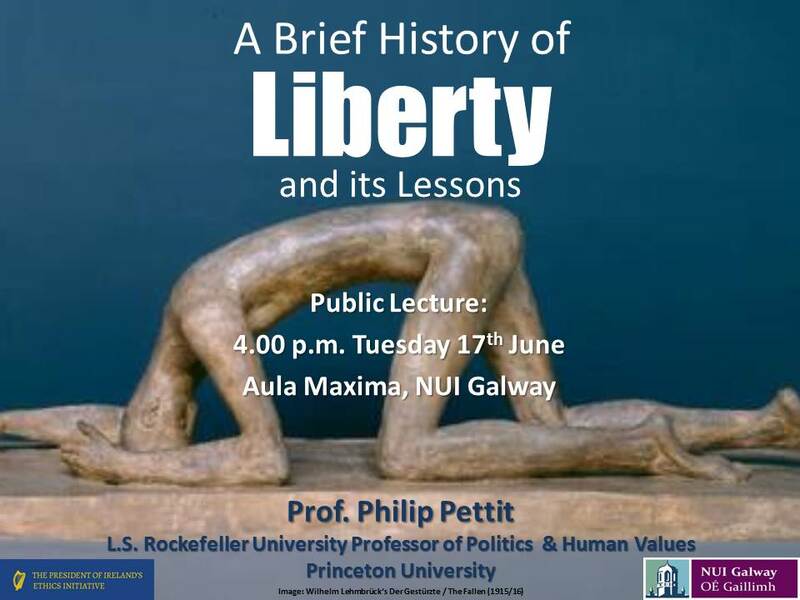 Distinguished Irish philosopher Prof. Philip Pettit of Princeton University will give a public lecture on ‘A Brief History of Liberty — and its Lessons’ in the Aula Maxima, NUI Galway at 4pm on Tuesday, 17th June 2014. This talk is being presented as part of the President of Ireland’s ‘Ethics Initiative’, and organised by the Power, Conflict & Ideologies Research Cluster of the School of Political Science & Sociology. The President of Ireland, His Excellency Michael D. Higgins, will be in attendance at the lecture. All are welcome and the event is free, but we would appreciate if you could register your attendance here. Philip Pettit, originally from Ballygar Co. Galway, is L.S. Rockefeller University Professor of Politics and Human Values at Princeton University, where he teaches philosophy and political theory. He is particularly renowned for his revival and development of republicanism within political philosophy, and for his work on group agency. Among his books are The Common Mind (1996); Republicanism (1997); The Economy of Esteem (2004), with G. Brennan; A Political Philosophy in Public Life: Civic Republicanism in Zapatero’s Spain, with J.L. Marti (2010); and Group Agency (2011), with C. List. Professor Pettit is a Fellow of the American Academy of Arts and Sciences, and of academies in his two countries of citizenship: Ireland and Australia. His recent book On the People’s Terms (2012) is published with Cambridge University Press. It is based on the 2009 Albertus Magnus Lectures in Cologne, and the 2010 Seeley lectures in Cambridge. Also forthcoming is a book with W.W.Norton for a general audience, entitled Just Freedom: A Moral Compass for a Complex World. He is giving the Tanner Lectures on Human Values at Berkeley in 2014-15. While in Ireland, Prof. Pettit will also be involved in a number of workshops, based on his work, in UCD, and will give the opening keynote address, on the infrastructure of democracy, to the third annual Garrett Fitzgerald Summer School in Dublin later in June. Abstract for the lecture is below the fold. This fascinating talk by feminist theorist Elizabeth Grosz was recorded in Duke in 2007 as part of a 2 day feminist theory workshop there that year. This talk was the keynote, offering a ‘utopian’ future vision and direction for feminist theory. Her vision is largely Deleuzian, foregrounding events, becoming and the importance of concepts for feminist and social theory. One aspect in this vision that I particularly liked is the necessity for feminist theory to transcend discourse and representation; to finally engage with the real, ‘which exists before texts and allows texts to refer’. Perhaps unexpectedly, Grosz, here and elsewhere, aims to reintroduce Darwin as a ‘radical social thinker’. Her conclusion rests on a number of recommended ‘displacements’ necessary for the future of feminist theory, which are based on the turn from identity politics and the ‘subject’. She recommends a ‘five-year moratorium on speaking on the ‘self'”, for example’. Secondly, she suggests a turn from epistemology toward ontology; for a thinking of the real over and against representation. A thinking of real matter, force and energy etc. Finally, Grosz recommends not an affirmation of the subject subjectified by culture, but rather an affirmation of the in-human; of animal becoming and microbial becoming, and to think what this means for sexual difference. My only comment is that Whitehead might also be deployed in this project. Most of what is said here is decidedly Whiteheadian as much as it is Deleuzian, if not more so. There are also echos of Latour and Stengers, two well known champions of Whitehead, in this new feminist future. I wonder, in the five years since this talk was recorded, if much progress has been made in this, I think correct, direction? Or has the lure of anthropomorphism and ‘the subject’ proved too strong? Accepting what A.R. Ammons called ‘the becoming thought’ is nevertheless where theoretical thinking appears to be currently at. It would be interesting to read a Whiteheadian feminist theory in place of the more common Deleuzian one. Perhaps that will fall to Butler in the future.